In this tutorial, we will be teaching Facebook users how to download or save the video they watch on Facebook Lite to their Android phone without using any third-party apps. By following the guidelines below, you will be able to directly download videos you watch on Facebook Lite to your phone. Facebook launched Lite in few Africa and Asia countries in early 2015 and from there the app was expanded to many other regions. 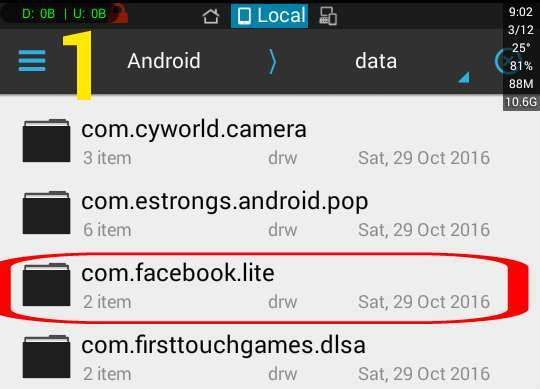 Facebook Lite is light in size and does not consumes data like the main app. Apart from these, it also runs well on poor network and smoothly on 2G (GPRS/EDGE) connection. After it was launched, many new features were added among which is the ability to watch video shared, posted, and that are visible on timeline. However, Facebook does not provide users the ability to download the video. There is a catch though, we bet many of you would have noticed it. 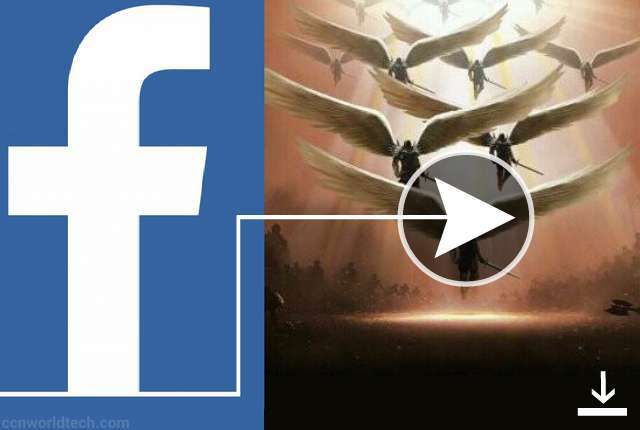 You will notice that when you click on the video you want to watch on Facebook Lite, the player will first load for some seconds before the video start to play. You will also notice that when the video stop playing and you go back, maybe to your timeline, if you click the video again it won't take time to load like the first time, it will play instantly. This give us the sense that the video is being download (cached) somewhere when you play it the first time, and when you try to play it again it will just load from where it was cached. Locating the place where the video was cached is our answer. The procedure we are about to share doesn't exist anywhere on the internet, you are lucky to be the first to learn this trick. On Lite, Facebook normally shows the size (in megabytes) of the video you are about to watch before you click on it as shown in the picture above. Pay attention to the megabyte because you are going to need it if you are going to get this tutorial right. Now, lets proceed. Update: Facebook no longer show the data size of the video, it is now hidden by default. You are going to need the following apps, not necessary but they will help. All videos watched on Facebook Lite are downloaded in a folder on the phone storage. We suggest you watch a video on Lite before you continue, this will create the folder we are about to show you. In our own case, we use ES File Explorer. 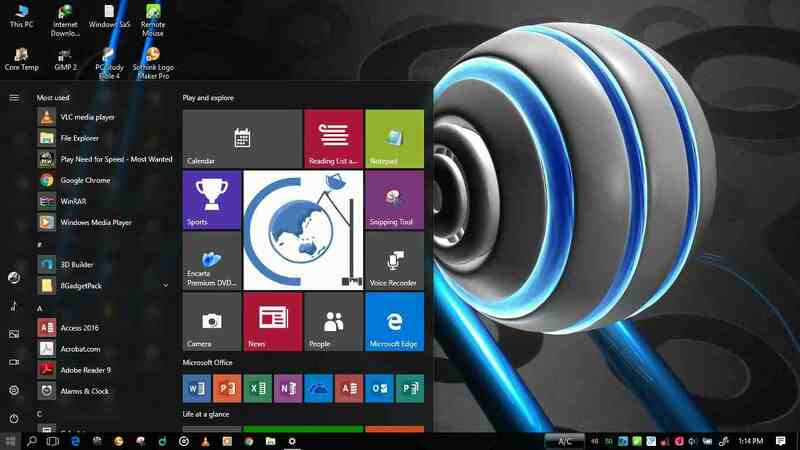 You can use any file manager of your choice. 1.) Open ES Explorer, locate a folder named "Android". 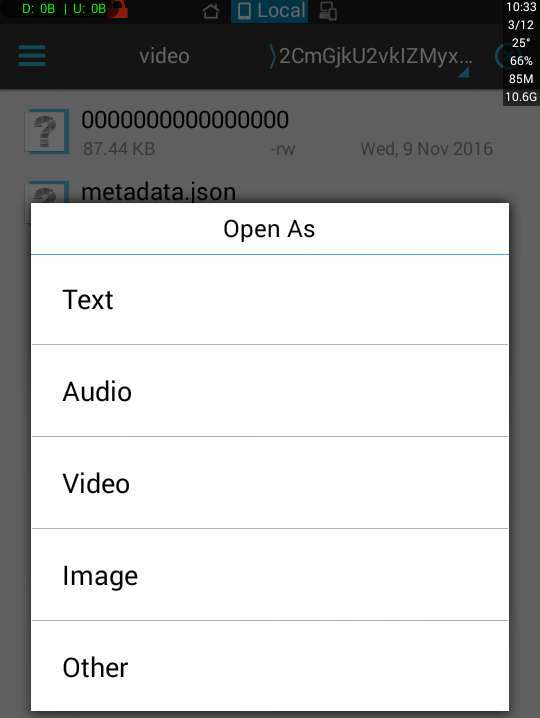 In the "Android" folder you will see another folder named "data", open it. It will lead you to where is shown in the above picture (We change the folder view to "Medium Details" under More -> View in ES UI). Among the folders, you will see the one named "com.facebook.lite", open it. 2.) 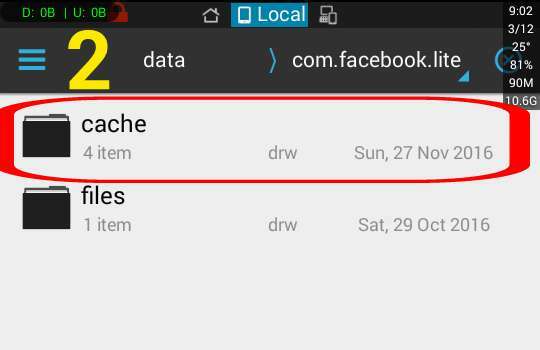 In the "com.facebook.lite" folder you will see the "cache" folder, open it. 3.) 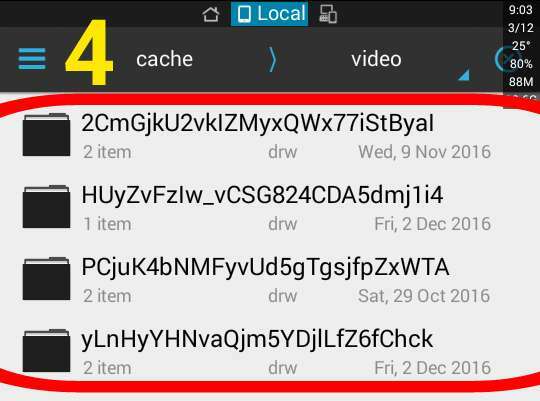 In the "cache" folder, locate the "video" folder and open it. 4.) In our own case, there are four different folders inside the "video" folder, in yours you may find more. However, it is important to let you know that each folder in the "video" folder represent each video you watch on Facebook Lite. As you can see, the folders are named in random letters that look like jargons. 5.) Opening one of these video folders there are two files inside, one named "0000000000000000" and the other "metadata.json". All the folders shown in step 4 contains only these two files. The "0000000000000000" file is the video we are looking for. All the four folders contains the "0000000000000000" video file and each file represent different video in each of the folder. Each folder is each video you watch on Facebook Lite. 6.) If you are using ES, just click on the "0000000000000000" file to open then select video from the menu, choose a video player ( or MX Player) and BOOMMM! the video will start playing. 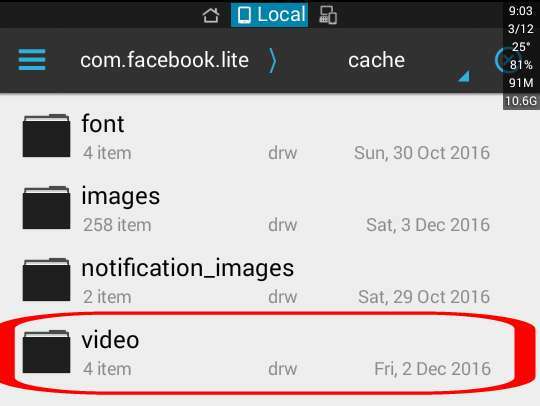 You can do likewise for other "0000000000000000" files in other video folders to watch the cached Facebook Lite videos. Please Note: The "0000000000000000" doesn't show as video file when viewed by a file manager because it does not have a video extension (e.g .MP4, AVI, 3GP e.t.c). Facebook do this so that video players installed would not be able to fetch it when scanning the phone. It is a security measure. You need to open it directly with a video player to be able to view the file as a video. 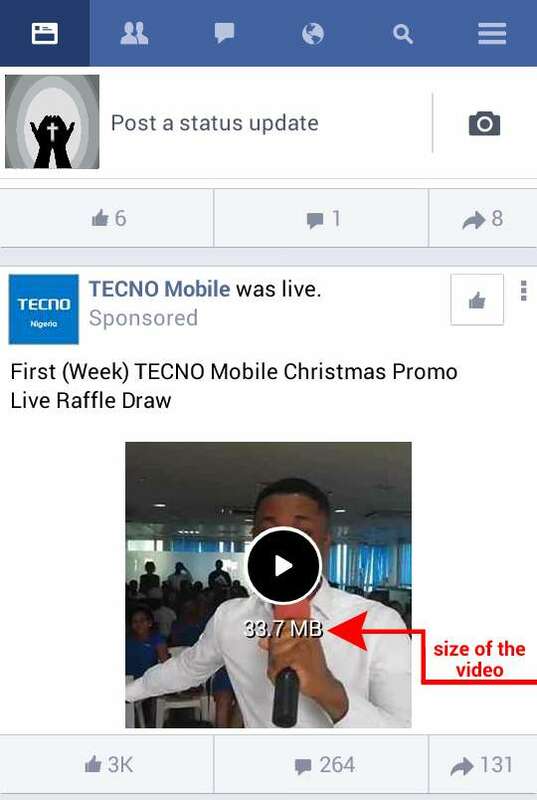 Every time you watch a video on Facebook Lite, the video is cached (download) on the phone memory card. By following the steps above, you can rename the "00000000000000" which is the video file and watch it offline forever. You can even copy it to a separate folder to keep save. 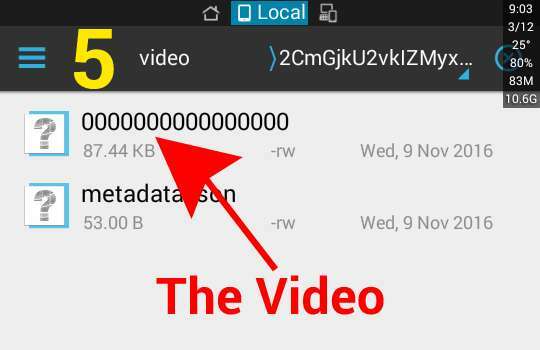 To let it appear in your phone video player, simply add ".mp4" to the file name. For instance, if you rename the "0000000000000000" file to "comedy", simply add .mp4 to the comedy so it look like "comedy.mp4". That's all. If you find this post helpful, don't forget to share it with friends.